*This issue was preceded by TMNT Mutant Universe Sourcebook #2. 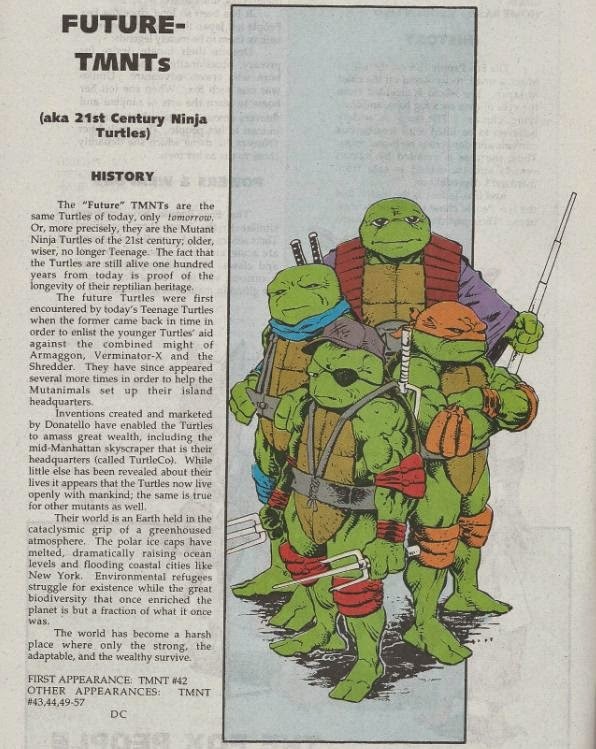 *Being released in early 1994, this issue featured info up through TMNT Adventures #57. *This issue was originally advertised in TMNT Mutant Universe Sourcebook #2 as coming out in October of 1993. It apparently met with delays. *Though the cover and credits page title this as No. 3/Volume 3, the indicia credits it as simply “TMNT Mutant Universe Update”. *This issue also contained a bonus fold-out poster of all three Mutant Universe Sourcebook covers (art by A. C. Farley). 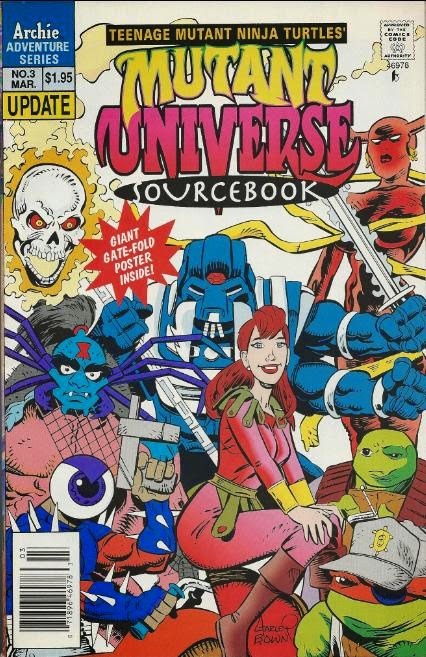 As what was likely intended to be the first of many annual update volumes (which never proceeded to be, as TMNT Adventures was cancelled about a year or so later), Mutant Universe Sourcebook #3 sort of picks up the dregs of the series as all the major characters were covered in the previous two “A to Z” volumes. What Sourcebook #3 mainly covers is all the meaningful characters to appear in the various Specials and miniseries. This can be rather troublesome, particularly in regards to the Specials, as those things were always whacked-out and insane and of dubious canonicity to the ongoing TMNT Adventures series. A. C. Farley tries his best to render these characters, most-often drawn in ultra-surreal styles in the original Specials, as congruously with the character designs of those featured in the primary TMNT comic, but he can only do so much. That isn’t to say the characters from TMNT Adventures #30-something through #50-something featured in this update aren’t all patently ridiculous, as many of them are (this volume covers a span of time in the comic that was heavy with outer space and time travel influences more-so than mutagen-born baddies). The only primary Turtle characters already covered in the previous volumes to get actual status updates are the TMNT (via their Future selves) and the Shredder (who had recently come back into focus as a major player by this point in TMNT Adventures). If you aren’t familiar with the later issues of the Archie series or the Specials, then you might be in for a very different experience than what you go from the previous volumes. Those volumes covered many characters exclusive to the comic series, but also characters with appearances in the Fred Wolf cartoon, the Konami video games and the Playmates toyline; characters with broader familiarity. 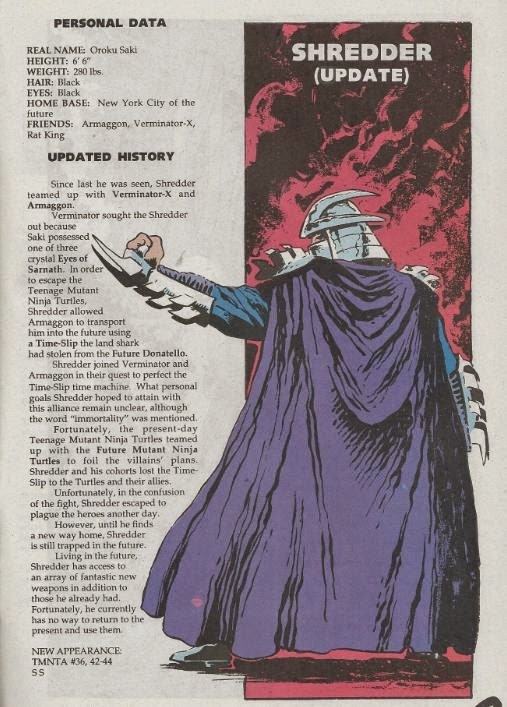 The characters seen in issue #3, however, are entirely exclusive to the last half of TMNT Adventures, having appeared nowhere else in Turtles lore, and are just about all tremendously obscure. So even for someone relatively well-introduced to the TMNT, flipping through this book, you might not at first glance even realize it focuses on TMNT characters. At least not recognizable ones, anyhow. 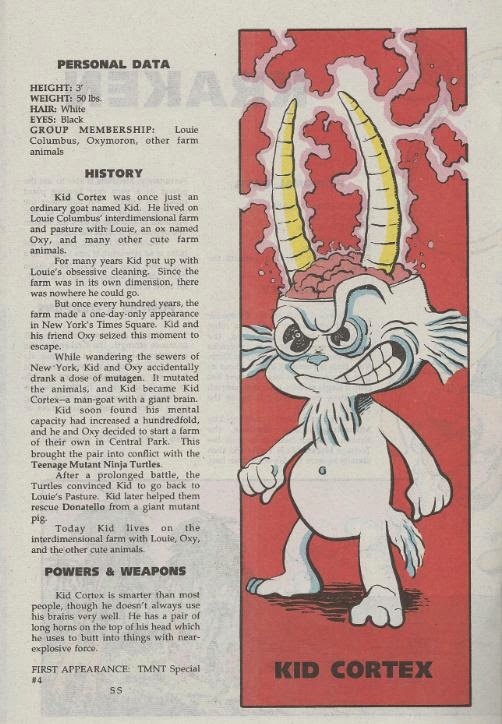 That’s not as much a point of contention as it sounds, as TMNT Adventures had moved away from shilling for Playmates products and had removed Krang and co. early on, eliminating the stale tread of animal-based mutants to fill the TMNT’s rogues gallery; a fairly wise decision, actually. However, while the first two issues have broader appeal due to their media crossover content, so even those who only collected the toys and never read the comics could find enjoyment out of the issues, Sourcebook #3 is going to be appeal exclusively to dedicated readers of TMNT Adventures.